On December 30, 2017, Chinese paparazzi exposed the alleged extramarital affair between actress Li Xiaolu (李小璐) and rapper PG One, which has brought media attention back to Li Xiaolu’s 6-year marriage with actor Jia Nailiang (贾乃亮). Both Li Xiaolu and Jia Nailiang have yet to give a concrete response in regard to the affair. Both actors continued to stay active in the industry, and they have continued to take care of their daughter together. Although there have been reports of divorce and separation, Li Xiaolu’s post about the Mid-Autumn Festival this week has created speculation that the couple are actually back together. 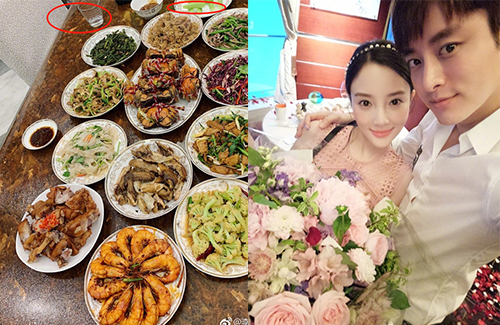 The picture Li Xiaolu shared was a photo of the dishes she ate for the Mid-Autumn Festival. It was a luxurious dinner, with plates of meat, vegetables, and seafood. What got people interested, however, was not the amount of food she ate, but the glass of baijiu on the side. According to various sources, only Jia Nailiang drinks baijiu in the family. If this speculation is true, it is very likely that the couple have put the cheating scandal behind them. 3 comments to Are Li Xiaolu and Jia Nailiang Back Together After Cheating Scandal? Perhaps in the first place it was all speculations.